It’s estimated that at least 1 in 25 adult drivers have fallen asleep behind the wheel of a moving vehicle. Automotive fatalities make traveling by car one of the most dangerous methods of transportation available. Considering that most Americans travel by car every single day, too many can be affected by a sleepy driver on the road. 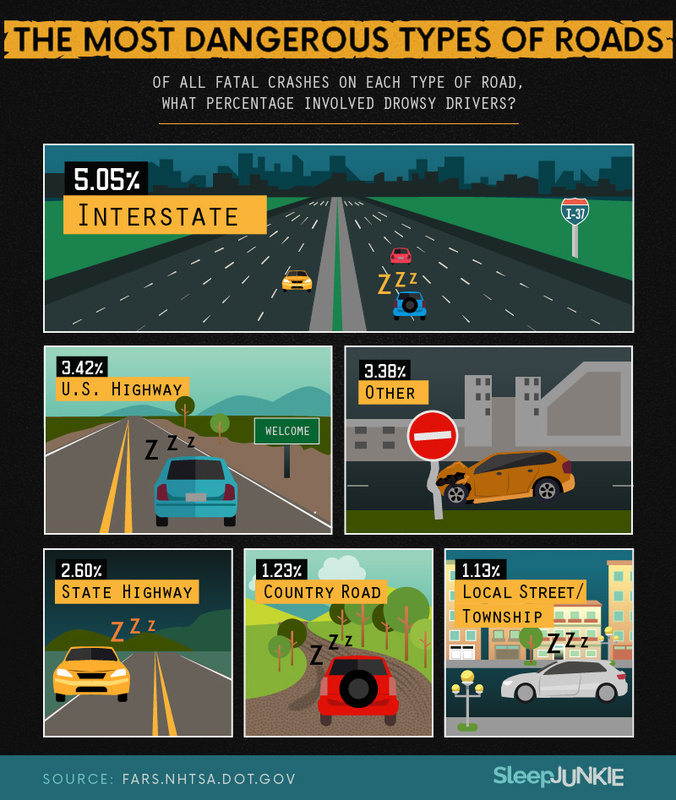 To understand which roads, states, and times of day have the most sleep-related fatalities, we analyzed six years of fatal driving accidents to illustrate the deadly effects of driving while drowsy. Read on to see what we discovered. When we looked at interstates in the U.S. that had the most driving fatalities related to sleep, Interstate 37 in southern Texas had the highest volume of fatal driving accidents (more than 18 percent). Covering roughly 145 miles and running between San Antonio and Corpus Christi, I-37 was opened in 2010 and links South Texas to the northern parts of the state. Unfortunately, commercial drivers are among those most likely to drive drowsy, like those who drive semitrailer trucks which can weigh up to 80,000 pounds – making accidents involving these vehicles especially dangerous. 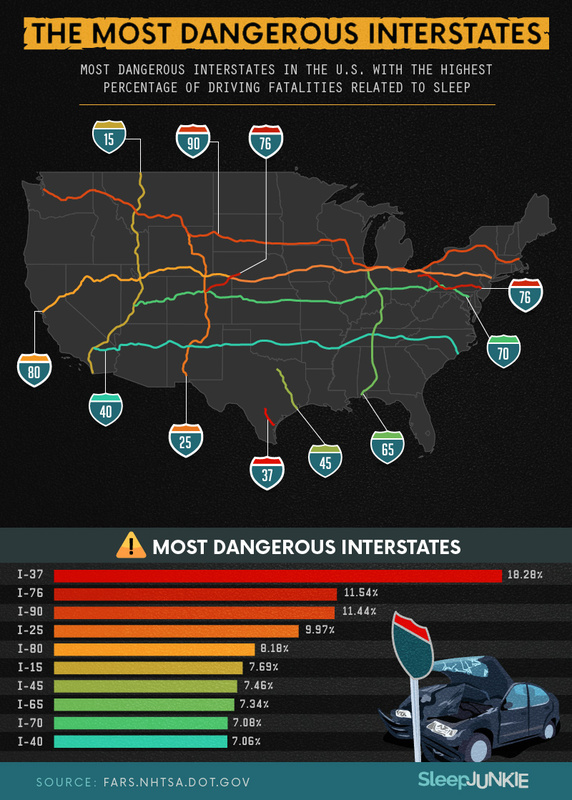 Other dangerous interstates in the U.S. include I-76 (11.5 percent), which covers about 440 miles between Ohio, Pennsylvania, and New Jersey, and nearly 200 miles across Colorado and into Nebraska. Interstates 90 and 25 also had a high percentage of vehicle fatalities related to sleep. I-90 (11.4 percent) is a transcontinental interstate that covers over 3,000 miles and crosses 13 different states, while I-25 (10 percent) runs north and south from Wyoming to New Mexico, extending over 1,000 miles. The most dangerous roads for fatal sleep-related driving accidents run through the state of Texas. U.S. Route 285 experienced the most vehicle fatalities related to sleep. This highway covers 846 miles and runs through Texas, New Mexico, and Colorado. U.S. Route 277 had almost 15 percent of fatal sleep-related accidents. This road covers just under 634 miles and passes through Texas and Oklahoma. Further, U.S. Route 79 reported just over 13 percent of these types of accidents. It crosses between five states, starting in Texas and ending in Kentucky. While there are no tests to determine a person’s level of sleepiness, some studies indicate that being awake for more than 18 hours can produce an impairment equal to a blood alcohol level of .05, which elevates to .10 after 24 hours. A blood alcohol level of .08 is considered legally drunk. Making sure that you’re well-rested before driving can save your life and the lives of others sharing the road. The most dangerous roads for fatal sleep-related driving accidents were interstates. While both interstates and U.S. highways can travel across state lines, interstates tend to have fewer on-off points and no cross traffic. This means that those driving on interstates travel for longer stretches of time with few opportunities to rest. Generally, interstates do cross into multiple states and stretch for hundreds or thousands of miles, but some can start and end in the same state. 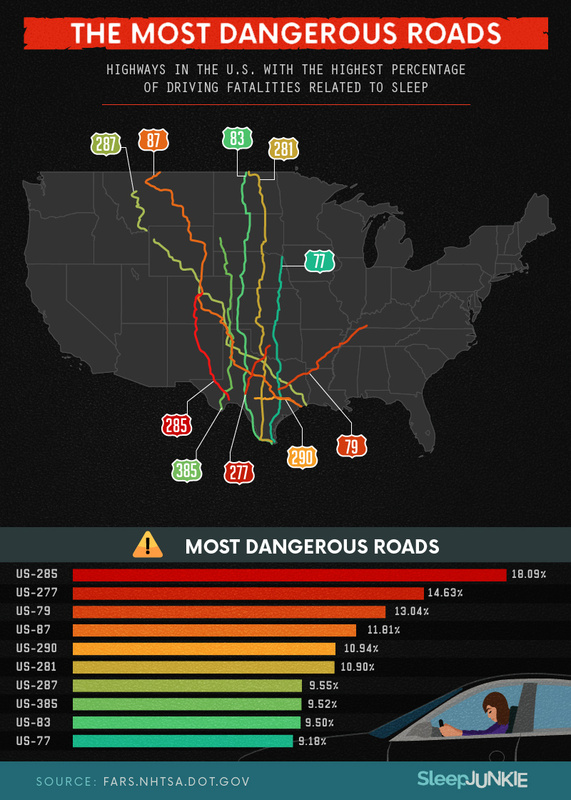 U.S. highways were considered the second-most-dangerous road type. Like interstates, U.S. highways can cover thousands of miles and pass between multiple states, but they also include more junctions or intersections. For this reason, highways can see more traffic than interstates at some points. Because interstates and U.S. highways cover large distances – and those traveling for long periods of time are more likely to utilize them over local streets or country roads – they each have a higher percentage of sleep-related traffic fatalities. Signs of drowsy driving can include frequent yawning or blinking, difficulty remembering recent miles traveled, and missing your exit. If you begin to experience any of these symptoms, it’s important that you find the closest rest station, or accommodations, to avoid a potentially dangerous situation. After examining fatal sleep-related automotive accidents across six years, Wyoming was found to have the highest percentage of deadly collisions, with nearly nine percent of these types of accidents occurring. While Wyoming may be a relatively rural state, it has some of the longest roads in the country and severe winters that can account for deadly driving conditions. Some rural roads also fail to provide standard amenities at their rest stations, making it harder for those driving over long periods of time to stay stimulated. Vermont, Colorado, and Texas came next, each with numbers in the 6 percent range. 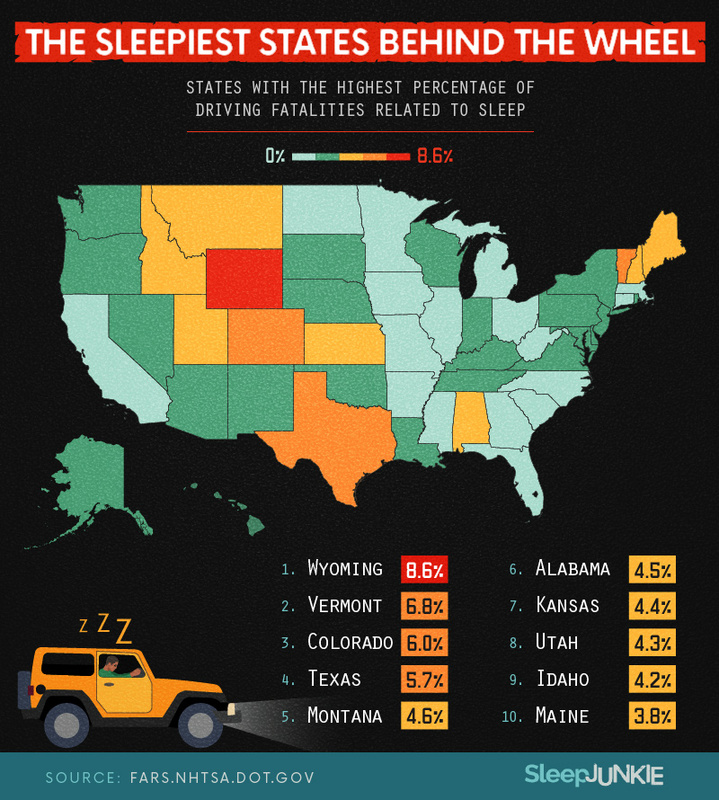 Considering that many of the most dangerous highways and interstates pass through the state of Texas (and several other top 10 states like Alabama, Kansas, and Colorado), it makes sense that the Lone Star State reported high percentages of lethal sleep-related accidents. Driving for extended periods of time isn’t the only way to accidentally fall asleep at the wheel. Not getting enough sleep the night before or driving on the road before you’re fully awake can be just as dangerous. When we looked at the times of day that most sleep-related driving fatalities occurred, we found that the most accidents took place between 6 and 7 a.m. The hours before and after (5 a.m. and 7 a.m.) were also exceptionally high compared to the rest of the day. Drivers who don’t get enough sleep, or who suffer from untreated sleep disorders (like sleep apnea), are more likely to drive drowsy than those who get a good night’s rest. Research has shown that adults need anywhere from seven to nine hours of sleep every night for healthy functioning. Getting too little sleep over a longer period can impede awareness and reaction time. Weather and light on the road may also contribute to dangerous conditions that promote falling asleep at the wheel. Most fatal sleep-related accidents over the past six years occurred around dawn. Considering that early morning hours were more common for these deadly collisions, the early light of day may not do much to illuminate the roads for sleepy drivers. Darkness, particularly on roads that aren’t well lit, or lit at all, can also contribute to dangerous driving conditions when drowsy. Lack of light stimulation can make it easier to fall asleep, making poorly lit roads particularly dangerous for those who may already be driving while tired. 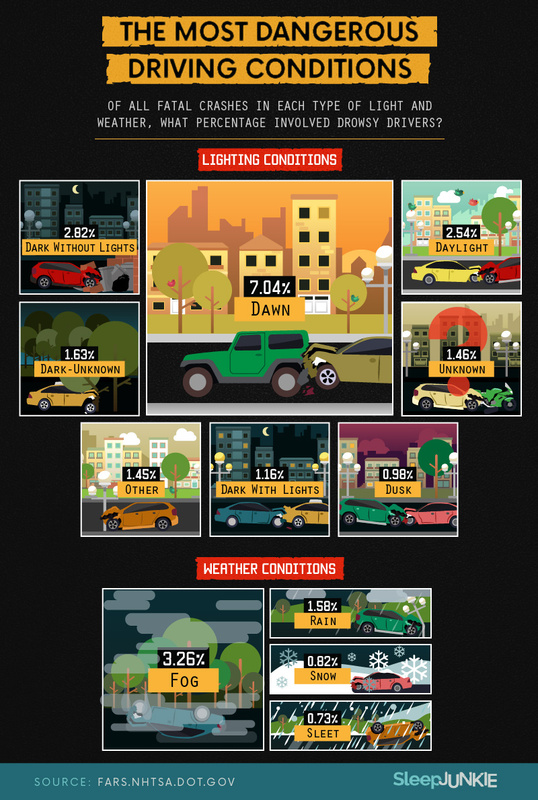 There was also a high percentage of sleep-related driving fatalities that occurred in rain and fog. In general, rain is the most dangerous weather condition for driving, although research has also shown that rainy conditions can disrupt our sleep. 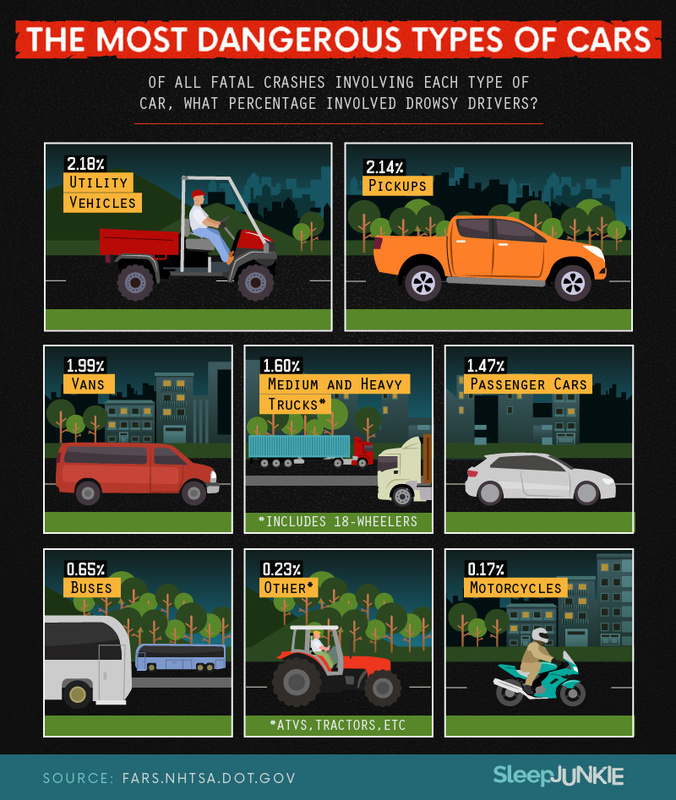 Utility vehicles were the cars most frequently involved in fatal sleep-related accidents. Other large vehicles, like pickup trucks, vans, and medium and heavy trucks, were also involved in a high percentage of these types of accidents. While bigger, heavier vehicles are generally considered safer in a head-on collision, they can also be more dangerous in some circumstances. SUVs, for example, have a higher center of gravity and are more likely to roll over depending on the nature of the crash. Because of this, they are also more likely to be involved in a single-vehicle crash. When you lose control of a heavy vehicle like these, bigger may not necessarily be better. When we looked at counties that reported fatal sleep-related driving accidents over the past six years, those in California and Texas had the highest number of incidents. In California, San Bernardino, Riverside, Los Angeles, and San Diego Counties reported a combined 116 deaths due to drivers falling asleep while driving. In Texas, Bexar, Dallas, and Atascosa Counties reported 73 deaths combined. 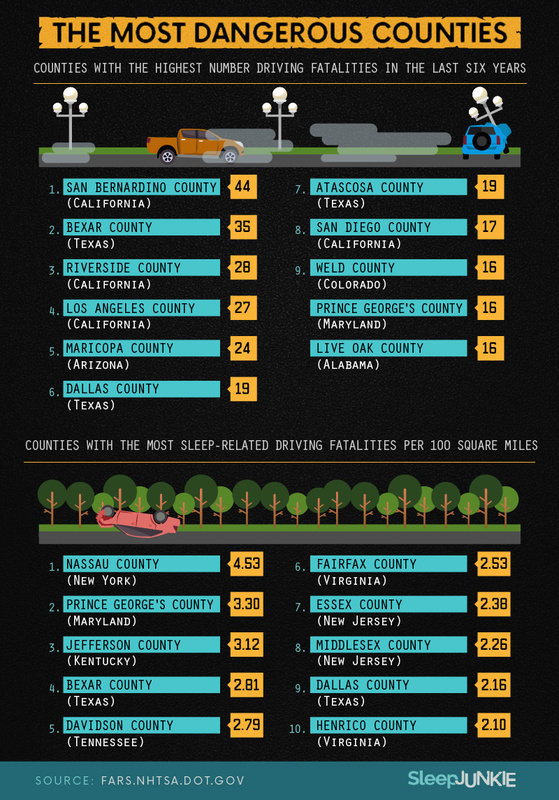 When we looked at counties that had the most sleep-related driving fatalities per 100 square miles, New Jersey, Texas, and Virginia had the most counties listed. In New Jersey, Essex and Middlesex Counties each had around two deaths for every 100 square miles, while in Virginia, Fairfax and Henrico Counties had 2.5 and 2.1 deaths respectively across the same distance. While it can be hard to calculate the total number of fatal car accidents that occur every year due to sleep-related mistakes, some estimates suggest that over 1,500 people die every year due to someone falling asleep behind the wheel. Certain interstates (like those in Texas) may be more prone to these tragedies than others. Weather conditions, like rain and fog, can escalate driving risks. But overall, many of these accidents could have been avoided if the drivers had enough sleep under their seat belts before heading out on the road. Sleep Junkie is your source for tips and research on how to sleep better at night. Getting a full night’s rest doesn’t just mean that you have more energy in the morning; it might also help you avoid a life-threatening mistake like accidentally falling asleep behind the wheel of a car. Obtaining adequate rest also means making sure you have the right tools to get the job done. An old mattress may be keeping you up at night and making you drowsy throughout the day, even while you’re driving. 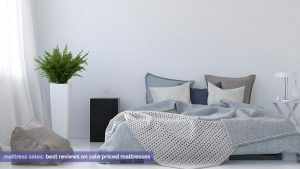 Sleep Junkie can help you find the right mattresses (with the best value) to make sure you’re getting the best sleep possible and waking up in the morning refreshed and ready to take on the day. Visit us online to learn more. 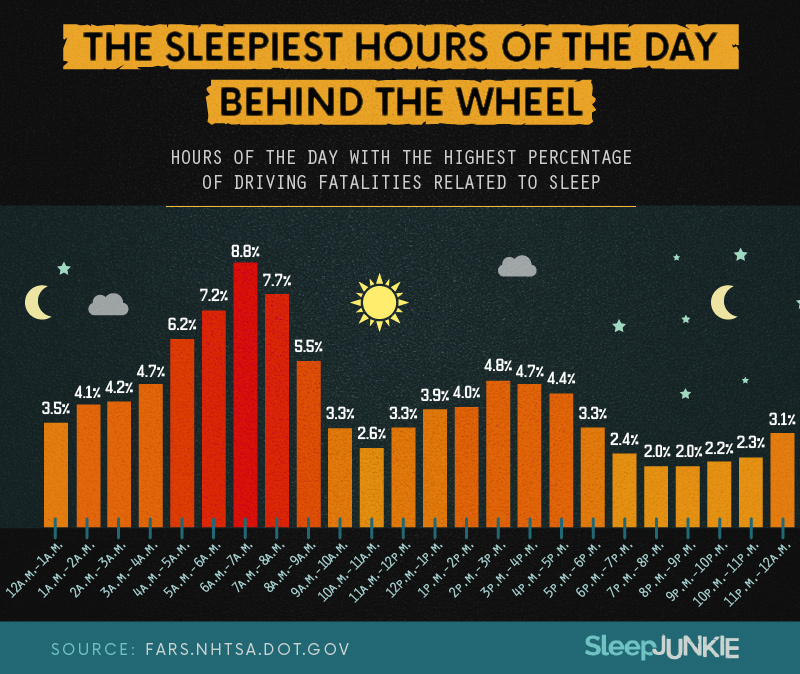 We used the National Highway Traffic Safety Administration’s data from 2010 to 2015 to discover how many sleep-related fatalities occurred by road, road type, state, hours and time of day, atmosphere, type of car, and county. The definition for sleep-related accident is a fatal car accident in which at least one vehicle involved in the crash was coded as “2” (Asleep or fatigued) in the DRIMPAIR (Condition (Impairment) at Time of Crash- Driver) variable. Percentages were calculated by dividing its total sleep-related fatalities by its total fatalities, except for the county and type of car assets. The percentage for type of car was calculated by dividing the number of sleep-related cases by the total number of cars in fatal crashes. Finally, the county numbers were presented in two ways: first by county alone and then by number of sleep-related fatalities per 100 square miles. Counties with fewer than 100 per square miles were excluded. Don’t fall asleep at the wheel. 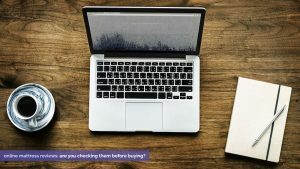 Be sure to credit our authors by linking to this page when sharing our content for noncommercial purposes.